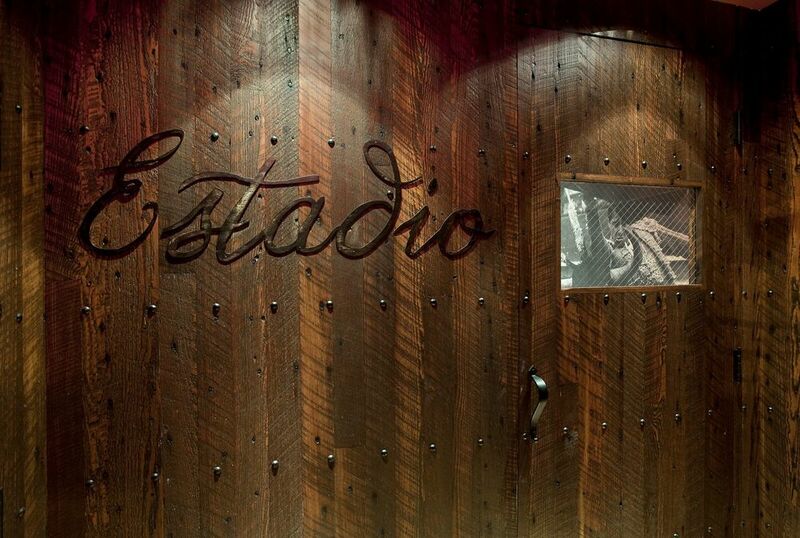 Inspired by the dining tales of the chef’s scouting romp across northern Spain, balance pervades every aspect of Estadio. The menu blends classic Spanish dishes with contemporary interpretations of this fabled cuisine, and GrizForm Design Architects was tapped to create a design concept that acknowledges time honored Spanish materials and textures while incorporating modern lines and elements. A contemporary open kitchen bar is framed by Spanish marble and a bulkhead covered by wrought iron rosettes. A poured-in-place concrete bar is set against the backdrop of 19th century reclaimed Spanish tile and a Spanish stone wall. 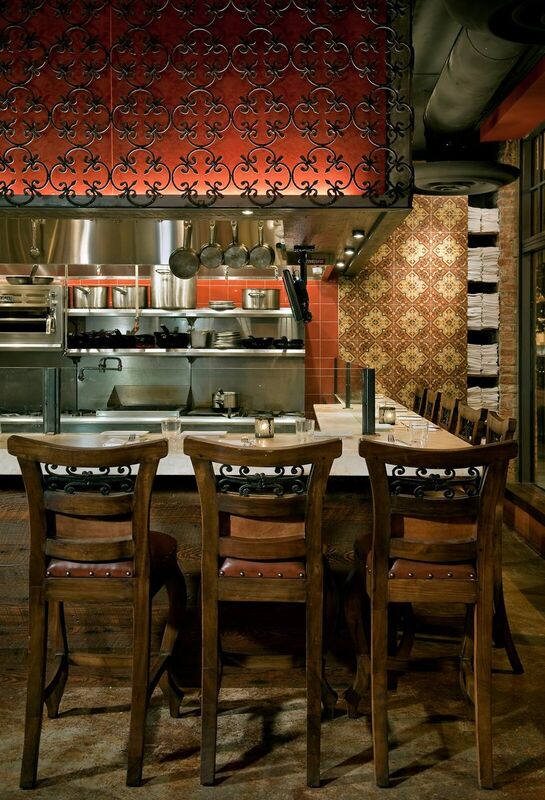 Custom sleek, steel and wood swivel bar stools bolted around the bar contrast dramatically with custom oversized iron and wood chairs patterned after those in a venerable Madrid restaurant. 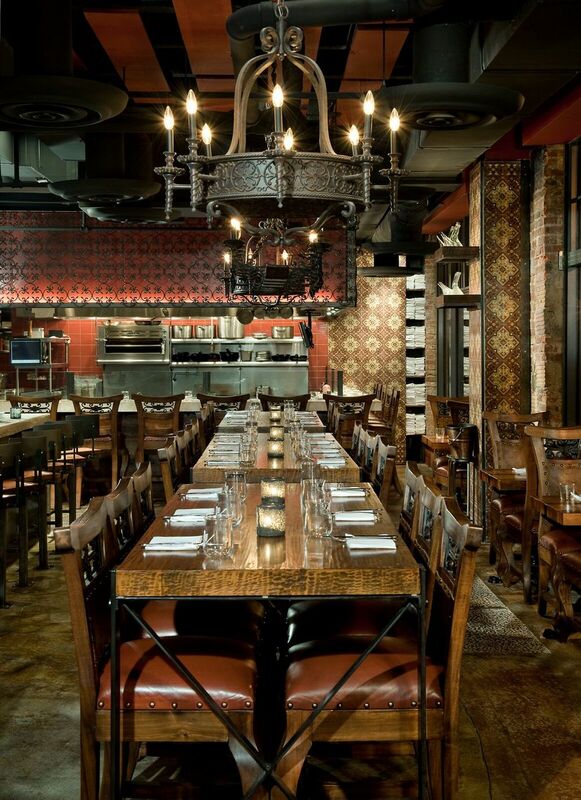 Stylized wood tables are subtly illuminated by antique Spanish lighting fixtures. Leather paneled walls frame a semi-private room, but the lustrous panels are harmonized by a rustic wrought iron rosette overlay. Murals of early 20th century bullfights present powerful imagery, but one that is soothed by elegant pictures of flamenco dancers and the finesse of vintage Spanish soccer displayed on monitors above the bar.